Today, you are a member of ... Incomparables - You Are A Member! 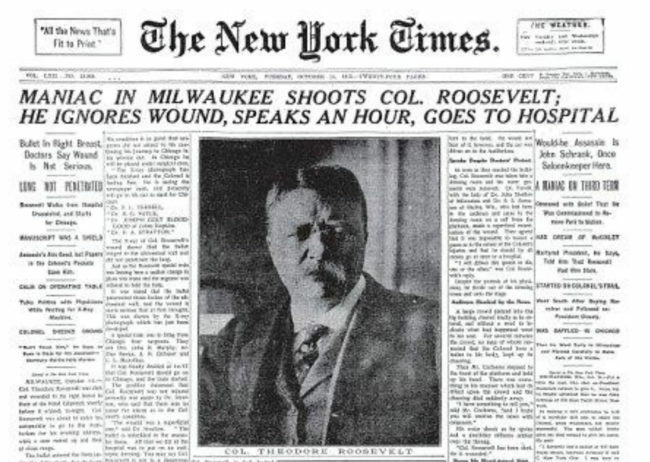 Now it would be safe to say that, here in the present day, supporters of the more grandiose ilk would liken their candidate to TR and his tenacity. But Members would know it’s more apt to liken the notorious HRC to the speech itself – evidence of the public lexiconical manner in which politics spheres itself, an oratory given despite incredible lengths to go to prevent it, not only by the gun wielder, but by TR’s concerned staff. It also would be more apt to compare the man with the hair to the pixelated newsprint that distorts the scan of the newsprint by which you can read about this incident. So this week, Members, as we roll into the fin de siecle of Election 2016, mull this comparison and keep in mind that the bodies in which you choose to express your political self – even fantastical, historical, long dead ones – have literal, figurative, and incomparable weight.